Ice Cleats Replacement Spikes are replacement spikes in case yours wear out, break, or get lost. Tungsten carbide points are 10 times stronger and retain their ice piercing edge longer than steel. 1. Can be used with all kinds of sports shoes, hiking shoes and mountaineering boots, wide application. 2. Brand new and high quality rubber material, good tenacity, convenient to match. 3. 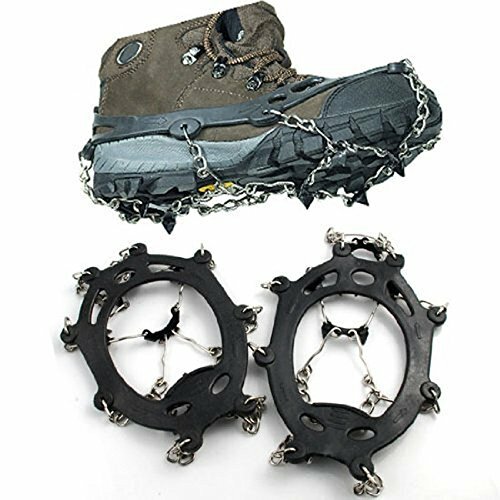 Eight teeth non-slip chains design can be used in general ice snow, grass and other slippery environments, suitable for the primary route walking. 4. The bag comes with crampons can effectively prevent crampons from scratching clothing or prevent damage to crampons, easy to use. View More In Winter Sports Accessories. If you have any questions about this product by abcGoodefg, contact us by completing and submitting the form below. If you are looking for a specif part number, please include it with your message.